(CNN) -- At least 43 people were killed and 117 wounded in a blast during Friday prayers at a mosque in Pakistan's Khyber Agency, a government official said. About 300 people were at the mosque when the blast went off, officials said. The incident occurred in the village of Ghondi in Khyber Agency. It's one of the seven districts of northwestern Pakistan's volatile tribal region bordering war-ravaged Afghanistan. Khalid Kundi, a senior Khyber official, said the bomber blew himself up in the courtyard of the mosque with 8 to 10 kilograms of explosive material. One worshipper said the blast was so loud, he passed out. 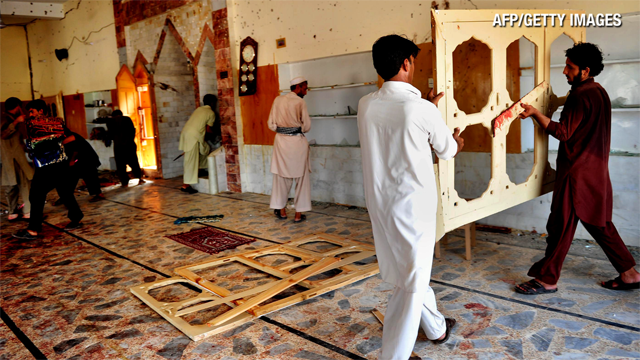 "When I stood up, I saw dead bodies and injured people everywhere," Hikmat Ullah Afridi said.